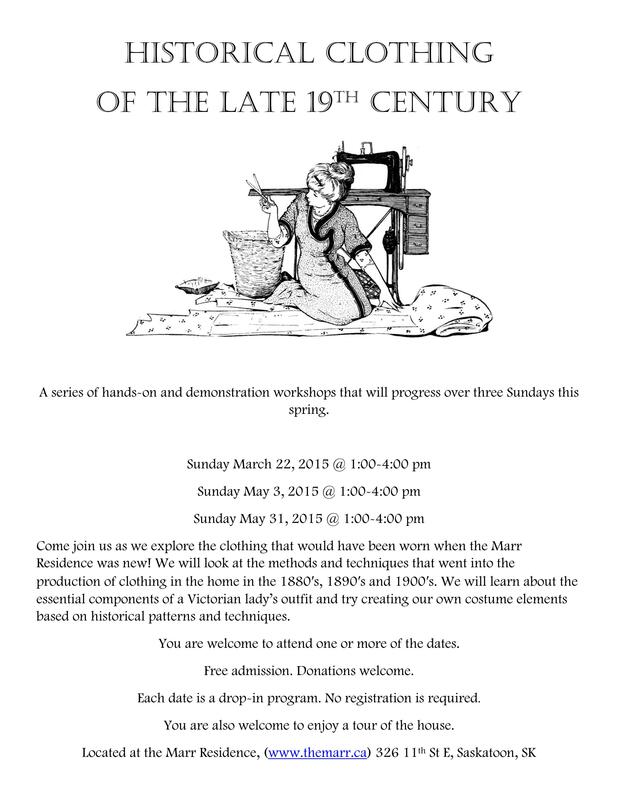 … is the slightly ostentatious name they came up with for a program (actually, a series of programs, or workshops, or afternoons of hanging out) I am coordinating at the Marr Residence, a local history site, this spring. The first one is tomorrow afternoon (Sunday, May 22, 2015), the other two are the first and last Sundays in May. I probably should have posted this sooner, although if I have five local readers who might even potentially drop by I’ll actually be a bit surprised. And frankly, I feel like a bit of a poser since I’m a long, long way from an expert on historical clothing or costuming. I’m justifying it to myself as a way to network and meet other people locally who might have an interest in historical sewing & costuming (and who may well know more than me.) 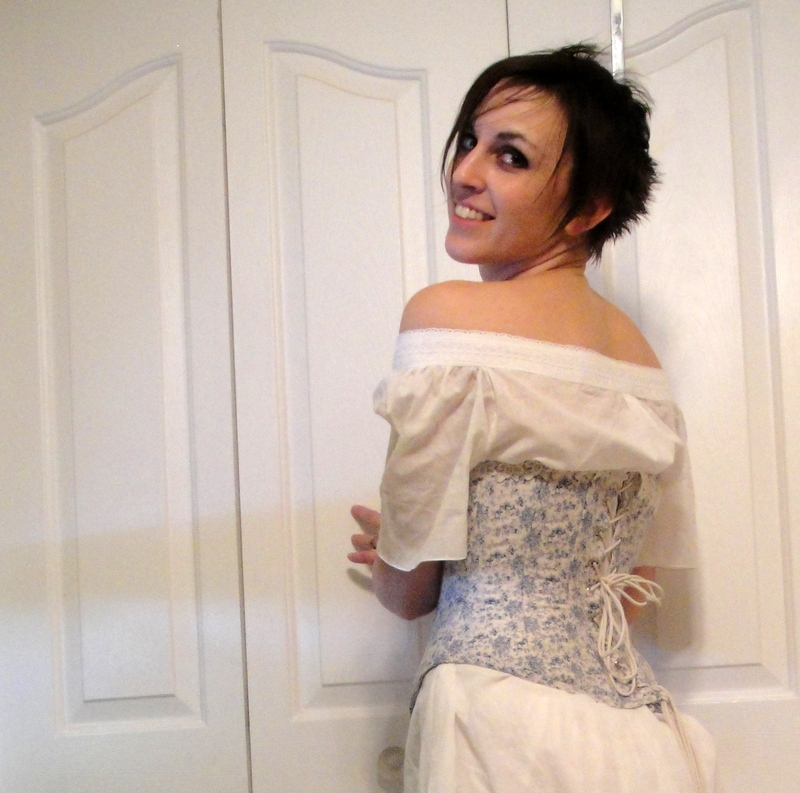 And it’s my little way of “creating an event” to explore my interest in historical sewing and costuming, since I really don’t want to just make costumes that have no other function but to hang in my closet. I do have a few hidden resources… like the Victorian Dress, and the rest of my mom’s antique clothing collection (plus a few lovely pieces in the Marr Residence collections) and reproduction catalogue collection. (I haven’t seen as much of the catalogue stuff around the webs, which is interesting… I feel like it gives a more day-to-day view of fashion than the fashion plates or even the period photographs. ), and I’ll be there with my own project (I think it’s BUSTLE TIME), and some sewing basics should anyone else want to drop by and do some sewing, or just some hanging out and talking. So yeah, um, those five of you who are in town (or is that three who’ll actually read this on a Saturday night, or one who might maybe have nothing better to do on a Sunday afternoon…) anyway, yeah, stop by! LOL! I wish I was local so I could drop in and say hey! I hope you get a good crowd! Wish I lived closer. Sounds like a neat exhibit. Sounds awesome! I hope it goes well! Ah, well, “history” over here is not quite was passes for history on your side of the Atlantic. 😉 That’s too bad you’ve had no luck with the local museums, though! Very disappointing. Saw your picture in the newspaper after the fact – it was great. I may be in town for the others. Congrats! late to the party, and probably at least a thousand miles away, but this looks like a lot of fun. Let us know how it turned out!